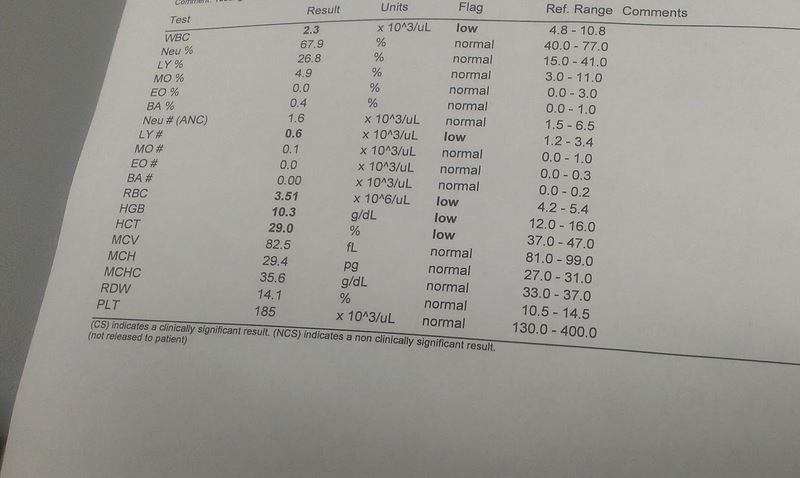 His Building Blocks: Update: my first week of Taxol treatment. 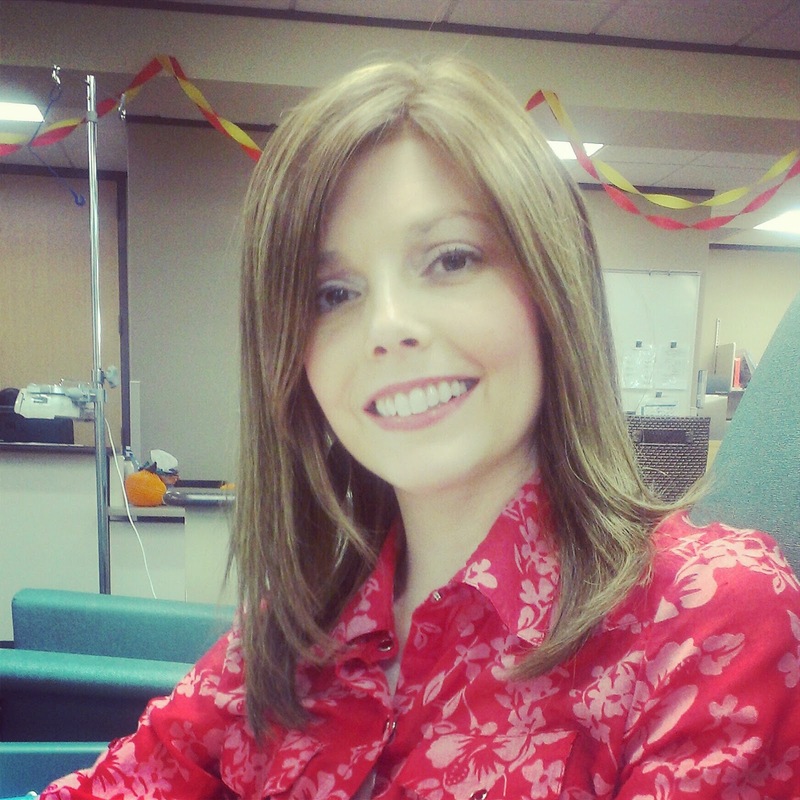 Update: my first week of Taxol treatment. It has been a week since I have created a blog post. Exactly a week ago today I was typing about my first round of Taxol from my chemo chair. We are here again today getting my 2nd round of Taxol. I am determined to have a different hair look for each chemo treatment. It's the simple things in life, that are so much fun, right? I thought the first round of chemo went WAY better than the first two rounds of AC chemo. In fact, I felt almost like my old self every morning. Then, right around lunchtime each day I feel like I have been hit by a freight train. Symptoms come on suddenly and it just feels like I have early stage influenza. I feel extremely tired, achy and like all I want to do is sit down/lay down. So, we are learning to work around my symptoms. I do every possible thing I need to get done during the first half of my day. During the second half, I try to do more activities with the kids that involve sitting. Then, I just pray they both take a great afternoon nap--at the same time. A coordinated afternoon nap is key!!! Otherwise, I don't get afternoon "rest" time. I am SO THANKFUL that I did not experience any of the potential serious side effects of Taxol. I am also thankful that Drew's parents were here for the first few days of my treatment to help out since this a new unknown for us. 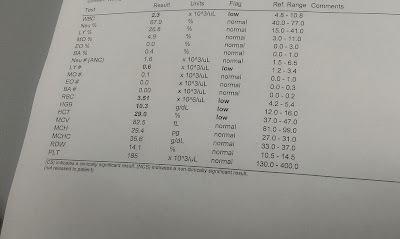 I was really curious how my neutrophil count would be effected this round, since the AC really hit it hard. Most patients don't need immune system assistance (in the form of a Neulasta shot or a Neupogen shot). But, then again, I haven't really been like most patients during all of this. The number we shoot for before every chemo session is an absolute neutrophil count (ANC) of 1.5 or higher. Of course, the higher the better (normal range is 1.5-6.5). I started with my ANC in the 4's last Monday. Today, my count was 1.6. It's on the lower end, but still, hooray! They are injecting the drugs via my port right now! I really pray though that the ANC takes a big leap up this week though. Since I started in the 4's last Monday, and I started at 1.6 this Monday, I am wondering what next Monday will be like. I need to stay on a weekly schedule with this! Again, I will continuing praying for a strong immune system. The Lord continues to answers prayers. No one in our family appears to have caught Abbey's highly contagious croup. Thank you Lord! We have all washed our hands so frequently that our hands are beginning to crack. We are remembering to wash Abbey's hands more frequently also. Trying not to catch the croup from Abbey has been quite an effort. Especially considering she crawls and moves all over the place, touching, playing (and putting in her mouth) all sorts of things (mostly toys). But, I think we are in the all clear zone now with that. Abbey is doing so much better as well. She only coughs during sleep, and it is less frequently than before. Also, it just sounds like a regular cough (not a croupy-cough). Buy whole foods and skip processed, boxed, packaged foods. Purchase nutritionally dense foods, and avoid those that don't offer much nutritional value. Eat grains, beans and legumes rather than expensive animal products. Buy in bulk and skip individually packaged items. Look for sales on items. I wish I would have done this years ago! After Abbey was born, I didn't treat my body very well. My nutritional focus was 99% on my kids and 1% on myself. I often wouldn't eat lunch until after they went down for naps in the afternoon. I would snack on cereal (although somewhat healthful) all throughout the day just so my blood sugar wouldn't dip down too low. I ate veggies infrequently (except for salads). Before Abbey was born, we thought we were eating well. We purchased "all-natural" foods and tried to incorporate as many fruits and veggies as possible. But, when I look back after what I know now (I have done a lot of research on this stuff), it really wasn't all that! Our diet was heavier on meats, cereals, and grains than anything else. Also, I had WAY too much sugar in my diet. Things are changing. I will never eat the same way! Not only is eating healthfully extremely smart, but it is very biblical as well. 1 Corinthians 6: 19-20 says, "Or do you not know that your body is a temple of the Holy Spirit within you, whom you have from God? You are not your own, for you were bought with a price. So glorify God in your body." Romans 12:1-2 says, "I appeal to you therefore, brothers, by the mercies of God, to present your bodies as a living sacrifice, holy and acceptable to God, which is your spiritual worship. Do not be conformed to this world, but be transformed by the renewal of your mind, that by testing you may discern what is the will of God, what is good and acceptable and perfect." 1 Corinthians 10:31 says, "So, whether you eat or drink, or whatever you do, do all to the glory of God." I could go on and on (and maybe I will in a separate post). The point is, I am healthy. That is what I am telling myself constantly. I am a healthy woman. I am putting good things into my body. I am being healed. I am seeking God and following his desire for my life: to be healthy and raise these kids to glorify God in all they do (including with their body and everything that goes into their mouths). We are trying to establish good habits into our children. I snacked WAY too much on junk (starchy, non-body-edifying foods) in front of them. Now, at my snack-time, I grab a clementine, a salad, fruit, a homemade smoothie or juice, or peanuts. We try to have only healthy-snack options at home. I really don't leave the house to go to the store since it has so many germs. So, if I can't just leave the house to buy junk, then I will likely not eat it. I can only incorporate this healthy lifestyle with God's help though because I am so, so weak in this area. I have an amazing husband though that is of a like-mind and supports me in so many ways through this. Flying solo doesn't work. I have to be in constant prayer. Thank you to all of you that have been supporting me in so many ways through this (including through prayer). I will end with a couple of cute pictures of Luke and a recipe he helped me with. I used Bob's Red Mill Flaxseed meal (and a bunch of other organic ingredients) to make some delicious, extremely healthful Bran Flax Muffins. The muffins are just packed with nutrients and fiber and are an excellent option for breakfast (which is the meal I struggle with the most--I used to eat honey-nut cheerios or frosted shredded wheat). I didn't get any photos of Luke "helping" me mix it all together. But, can you tell from the photos below how excited he was for them to be done and to eat them? watching the muffins cook in the oven. wishing time would speed up. trying to eat every last bite! He may have eaten a little muffin-paper. along with the muffin.